Mother’s Day is right around the corner and while our young children love to help prepare for the festivities that go along with Mother’s Day, their budgets might not allow for elaborate bouquets of flowers. So why not put together a handmade bouquet for the mother or grandmother in your child’s life? It’s a perfect Mothers Day craft to do with the kids! This Mother’s Day hand flower bouquet craft is not only easy, but it uses resources that you might already have laying around your home. Feel free to get creative when it comes to substitutions to what we’ve used for these flowers. 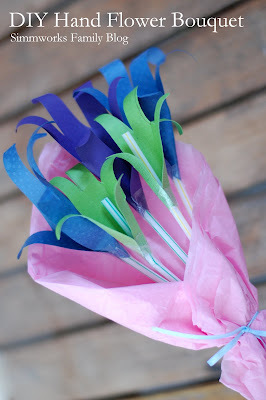 Not only do straws or pipe cleaners work great as stems for the flowers, but pens and pencils do too! Remember to get the kids involved. Let them help every step of the way. 1. Trace your child’s hand on the construction paper. Repeat multiple times until you have the desired amount of flowers needed for your bouquet. 2. Once done tracing, cut out outlined hands. 3. Wrap hands around straw and tape into place. Make sure that you tape the hand together and to the straw. 4. Using the pen or pencil you used to trace your child’s hand, curl each finger back to make the petals of the flowers. Repeat on each finger for each hand. 5. Take a piece of tissue paper and fold into half and then into quarters. Lay paper down and fold in one side as shown below. Tape down. 6. Lay flowers in corner of tissue paper and wrap taped side down over the stems. Tape closed. 7. Wrap other side of tissue paper over the stems and tape closed. 8. Cut a piece of ribbon to length and wrap around middle of bouquet. 9. Tie securely with a bow. And tada! The perfect personalized hand flower bouquet for that special mother or grandmother in your child’s life. About the contributor: Danielle is a work-at-home-mom of two beautiful kids and writes at the Simmworks Family Blog. She loves to blog about her family, healthy living, going green and crafting. She’d love for you to come visit! You can reach her on Facebook and Twitter as well. If you have any questions feel free to email her at simmworksfamily@gmail.com. What a neat idea. This gift would certainly melt any Mom’s heart! Great idea! I’m going to help my kids make this along with some coloring pages from http://www.thecolor.com/Category/Coloring/Mothers%20Day.aspx?holiday and have them present to mom along with breakfast in bed. Oh that is VERY cute! And any mom would love that have those flowers given to her for Mother’s Day! I want some! Need to show this to the husband and say, “here! Help the kids make this!” lol. What a fun craft to do with the family!! Such a cute idea and great way to incorporate your little ones into something special! Oh adorable! This would be a perfect craft to do with my kiddos! Aww this is a great idea!! I really like it and how simple and such easy to follow steps! Momma will love it!